After a long day of bowling in your bathrobe, it's nice to come home and crack open a cold one. And what better beer to sip as you defend your rug from nihilists than Pipeworks Brewing's cleverly-named white Russian imperial milk stout Hey, Careful Man, There's a Beverage Here? The Chicago brewery unveiled the Big Lebowski-inspired beer earlier this month, and it gathered quite the crowd of Little Lebowskis at the Beer Hoptacular last weekend. So what's actually in it? Not The Dude's cream and Kahlua, but Pipeworks got pretty damn close by adding cocoa nibs, vanilla bean, coffee, and lacto sugar to a Russian imperial stout. The result is sweet, lightly-colored brew with a none-too-shabby 10.5% ABV. 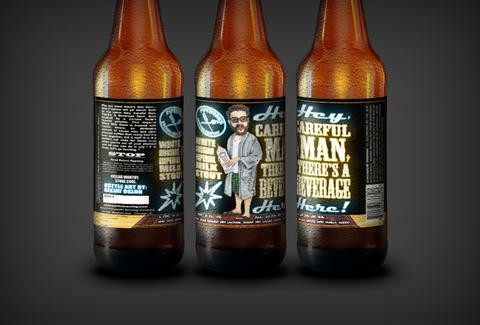 You might have a hard time finding Hey, Careful Man, There's a Beverage Here now, as it was distributed to limited liquor stores over a week ago, but Pipeworks' head of operations promises a barrel-aged version of the stout is in the works. The Dude very much abides.